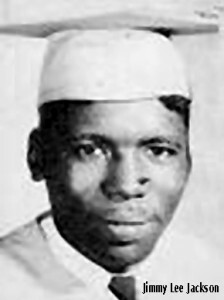 James Bonard Fowler, the man who shot Jimmy Lee Jackson, is given to frankness and simplistic statements. He mingles odd yarns from rural south Alabama with a sprinkling of short, declarative sentences. His demeanor is a sort of controlled rudeness and overbearing, tools he seems to want to use to convince the listener of a certain small-mindedness. All of this, however, is a façade belying an enormous complexity and intelligence. Seventy-year-old Bonard Fowler, you might say, hides his intelligence well. And he has, pretty much, until now, hidden the fact that he shot Jackson. That night at Mack's Café, Fowler says, "I don't remember how many times I pulled the trigger, but I think I just pulled it once. But I might have pulled it three times. I didn't know his name at the time, but his name was Jimmy Lee Jackson. He weren't dead. He didn't die that night. But I heard about a month later that he died." In February 1965, the whole of Alabama's midsection was unsettled, to say the least. In Marion, a town of only 3,000, police had arrested some 600 students, as well as James Orange, a popular field secretary for the Southern Christian Leadership Conference. Feeling something had to be done, local black leaders eventually managed to convince one of King's assistants, C.T. Vivian, to come to Marion for a nighttime speech at Zion. After Vivian spoke, the congregation, led by local leaders Albert Turner and Rev. James Dobynes, left the church two abreast to march down the block to the jail to sing for Orange's release. Perhaps as many as 50 troopers were on hand to assist the local police. The press was there as well. A few moments after Marion Police Chief T.O. Harris yelled over his bullhorn for the crowd to disperse, Dobynes knelt in prayer and was promptly whacked over the head by a trooper and dragged off toward the jail house. It was then that the lights went out. As troopers and police took off after the fleeing marchers, a group lit into the reporters. NBC News' Richard Valeriani suffered a serious head wound; the photographers and film crews had their cameras destroyed and lenses sprayed with black paint. Not a single photograph survived. During a lull in the chaos, Al Lingo, the head of the Alabama troopers, dispatched Fowler and a few other troopers to Mack's, where there were reports of people throwing bottles at passing cars. Fowler claims that people started throwing bottles and bricks from the upper story of Mack's down on the troopers standing in the street. "We went inside," he says. "The juke box was blaring, and it was pretty crowded. We told them that this has got to stop." Then, he says, there "might have been a few billy clubs swung. And out of the corner of my eye I saw a state trooper and an elderly black lady. She hit him upside the head with an old-timey Coke bottle. There were several people on this state trooper. I think one state trooper was down. I was going to their assistance when I realized someone was pulling my pistol out of my holster. And I reached down and grabbed [the pistol] around the cylinder, and he had the handle of the pistol. At that time I was very strong, and I remember swinging him around with my elbows and arms right like that, and he was right there, and my hand was on the trigger then, and I pulled the trigger." Normareen Shaw, the manager, was inside Mack's that night. She's quite sure it was nothing like the way Bonard Fowler described it. "I was in the kitchen," she said, "when I started hearing sticks whacking and people hollering. I said to them in the uniforms, 'Y'all ought to be ashamed of yourselves. These folks not doing anything.' They [the troopers] paused for a second; everyone did. Then these three other troopers came in and it all started again." "I didn't see no bottle flying, nothing like that," she said. "I can tell you one thing," said funeral home director Elijah Rollins. "There were no bottles or rocks thrown at anyone. I was upstairs in Mack's that night. I would know." For Fowler, the killing was simply self-defense. ... As far as Fowler is concerned, he thinks that self-defense makes this the end of the story. So he speaks of the time after Marion. He finally left the troopers in 1968, he says, to kill as many Vietnamese as he possibly could. They had, after all, killed his brother, Robert, a decorated war hero and near-legend in Geneva. But he came to love and respect the people he wanted to kill. "I have a great admiration for the Asian people," he says, looking across the couch to his wife of 10 years, Noie, a native of Burma. For him, the world would be a better place if we could all, as the Buddhists emphasize, "obliterate greed, selfishness, and envy." He'll tell you, too, that he has no patience with anyone calling him a racist. He says his embrace of the individual -- no matter the color, as long as the character is true -- goes back a long way. As a boy growing up, he felt safety and comfort in the bosom of blacks, he says. But the blacks of the civil rights movement, the ones he confronted, they were different from what he had always known. This was not their fault; it was the fault of outside agitators. "I think that segregation was good, if it were properly done," he says. Still, he professes love and admiration for many blacks. He calls Nelson Mandela the savior of a nation. Colin Powell is a wonderful man, he says, [who was] by far the wisest in an administration full of idiots. He's at home with the blacks in his corner of the county, neighbors, good people he would do anything for. And as for the symbol of the civil rights movement, Martin Luther King Jr.? "I'm on the side of J. Edgar Hoover," Bonard Fowler says. "I think [King] was a con artist. I don't think he's got a snowball's chance in hell of getting into heaven. No more chance than I do. His goal was to screw and ____ over every white woman that he could." That's bitter rhetoric for someone like Deputy Carlton Hogue to swallow. For him, Jimmy Lee's cousin and an admirer of King, a shooting 40 years ago in a forgotten café in a forgotten town is about justice, history, and family. "There ain't no statute of limitations on murder," he said. "That man needs to be prosecuted just like they did with Cherry up in Birmingham." For Carlton Hogue, it's that simple. John Fleming, an Alabama native, was former editorial page editor and editor-at-large for The Anniston Star in Alabama when this article first appeared in the April 2005 issue of Sojourners magazine. For more of the interview with James Bonard Fowler, see www.sojo.net.